So. One conference down and one to go. So it should be a fun paper to write. But I am not going to worry about it until after my Cathie paper. I have until July anyway. LOST AND FOUND!! Shaun Tan wins the OSCAR! My favorite illustrator ever to walk this great planet just won an Oscar for his short film adaptation of “The Lost Thing”. Truly I am ecstatic. He is the single most reason I have been considering studying for my PhD in Australia. I kid you not. I am so happy that the world will now see his amazing work. My favorites of his are listed in my list of my-all-time-favorite-books-ever-to-be-written-in-the-history-of-the-world but also “The Arrival” and “Tales of Outer Suburbia” are fantastic as well! If you are interested in his PB work, I would recommend the 3-in-1 collection called “Lost and Found” (Contains my favorites and “Lost Thing”) being released in the US March first! Tan, Shaun (2009). Tales from Outer Suburbia. New York: Scholastic. 96 pages. If you know anything about my short stint in the world of children’s literature, you may know that I have two loves: Harry Potter and Shaun Tan. (You also know I would accept marriage proposals from either whether imaginary or not.) Tales from Outer Suburbia is not an exception to this general rule. A collection of 15 illustrated short stories, this picturebook is usually shelved with children’s picturebooks. Ideally, such a book would rest in its home in the YA section of bookstores and libraries. The stories in this collection range from buffalos dwelling in abandoned lots to magical courtyards inside every suburban home to very persecuted stick men. There is not necessarily an over-arching storyline, but instead, small narratives–with pictures!–about various fantastical elements of the Australian suburban neighborhoods. 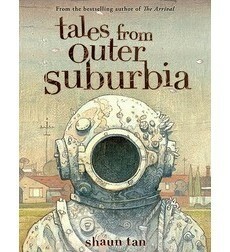 Tales from Outer Suburbia is a collection of “what if” or “it could be” stories that places it into the fantasy genre. While most picturebooks for children could technically be considered fantasy–Angelina Ballerina is a mouse and mice realistically cannot perform ballet–the nature of Tan’s stories pushes it into the realm of YA fantasy. Many of the stories feel odd and are even framed as story being told by a character, or in the case of “The Amnesia Machine”, the story is presented as a newspaper article, which can reasonably be argued into the science fiction realm. Indeed, much of Tan’s work hovers of the edge of dystopia, dabbling both in fantasy and science fiction. I recognize that many will take fault with the ease I cross between science fiction and fantasy as some camps do not like them intermingled; yet if any individual could create peace between the fantasy and sci-fi arguments, my faith is in Shaun Tan. He mixes the fantastic such as the magical courtyard in “No Other Country” with the science fictive elements of backyard missiles in “Alert but Not Alarmed”. 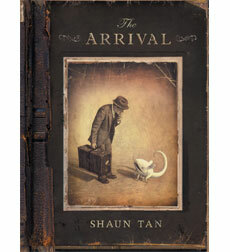 Shaun Tan’s other works have these genres and often a feel of magical realism such as in The Lost Thing and the graphic novel The Arrival. 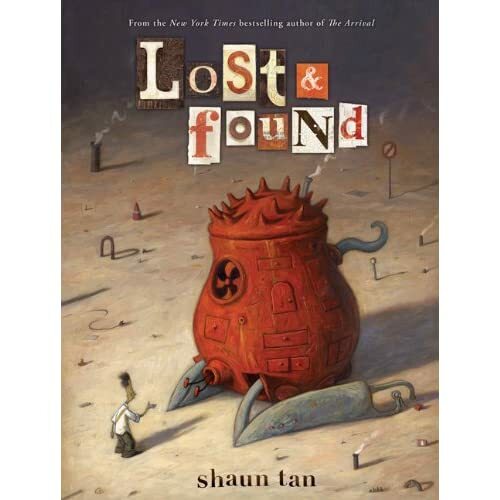 Because teenagers maybe reluctant to puruse a picturebook, thinking that they are the domain of younger children, I think it is important to emphasize the complexity of Shaun Tan’s work. The illustrations read as much of the story as the words. I think that the best way to introduce Tales from Outer Suburbia is to present some of the illustrations via a presentation tool or projection. The spread over pages 18-19 is particularly detailed and dynamic as is the illustration on page 93. To accompany the illustration on page 93, reading the complete story of “Night of the Turtle Rescue” would be a great hook for teenagers. (The story is only a paragraph and VERY open-ended). I am currently almost done summer school! Currently I am spending my Saturday evening reading Scott Westerfeld’s “Leviathan”–which I started in November and just never had the time to finish. But it is REALLY good at the half-way marker. Last evening was my birthday outing at Finale and Harp. I have some fantastic friends, thank you very much. I am going to continue my reading quest!